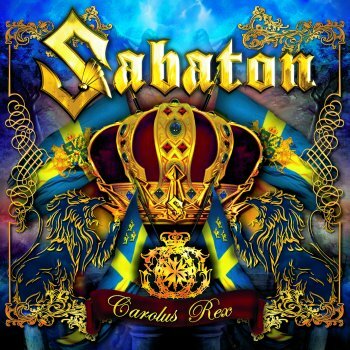 SABATON - CAROLUS REX (CD) | Online Shop | Wizard LTD.
SABATON, the power metal band from Falun, Sweden, have worked themselves up to the top. With over 500 shows in over 30 countries, songs and albums in top positions on the charts, excellent reviews and winners of several awards world wide, these guys never seem to stop. Six albums with additional tours have marvelled the global audience, and the lyrics inspired by different war themes define SABATON in their quite unique way. During their career, SABATON have been touring all across Europe together with Iron Maiden, Judas Priest, Scorpions and Accept, and have made fans all over the world. Early in their carreer, in 2001, SABATON won the biggest music contest in northern Europe, “Musik Direkt”. The album “Metalizer” was their first debut attempt, but it wasn’t released until five years later, in 2007. Instead, SABATON took the matter into their own hands and created a new album for a fresh new start. With Primo Victoria - “the first victory” - and Daniel Mяhr added to the band to master the keyboard, SABATON was completed. Their next album Attero Dominatus also became album of the month in Sweden Rock Magazine, and several magazines worldwide have also honoured SABATON’s albums with this nomination. Among claiming the title “Best Powermetalband” on Swedish Metal Awards in 2008, and winning UK’s Golden Gods Awards for “Breakthrough Artist” in 2011, Daniel Mullback was constituted as Sweden’s fastest drummer in 2006. SABATON reigned the charts in Sweden with their two upcoming albums, “Art of War” charted as #5 and its follow-up “Coat of Arms” peaked at #2 in Sweden, Top 20 in Germany and charted high over the whole world, including the US billboard chart. The single “Cliffs of Gallipolli” climbed to #1 of the Swedish charts immediately and reached gold status. SABATON also received two nominations for the Swedish Grammy Awards, won “Best Album” for “Coat of Arms” on Radio Bandit Awards in Sweden. “Coat Of Arms” (as well as the following live album/DVD “Battle Of The Baltic Sea”) was awarded a gold record in Poland and was later accompanied by a European tour of more than 160 concerts. The video “Uprising” featured Hollywood star Peter Stormare, and is one of the biggest productions in the metal industry ever. For their new album, “Carolus Rex”, SABATON have abandoned the lyrical themes of WWII and got back to their own country, delivering an extra symphonic and epic concept album about the Swedish Empire (1561-1721) which was created in cooperation with well-known Swedish historian Bengt Liljegren. The bombastic sound was set up by iconic producer Peter Tagtgren (PAIN, HYPOCRISY), who is also featured as a guest vocalist. “Carolus Rex” will be out in late May 2012, and this year will also see SABATON touring and performing at festivals all over Europe followed by an UK and European tour in fall.